A JUBILANT High School Old Boys team in party mode after securing their third consecutive Lee Bros Shield as Poverty Bay premier club rugby champions at Rugby Park on Saturday.High School Old Boys hoisted the Shield for club rugby supremacy at Rugby Park on Saturday for the third year running on the back of a monumental performance by their forwards. Earthwork Solutions HSOB shut first-time grand finalists Aon Waikohu out of the final with straight, hard running. The 34-3 scoreline was one of the most emphatic results in shield final history. “The boys know what it takes to win a final and they showed it,” said HSOB centurion, co-coach and player Scott Leighton, who came on in the second half. Waikohu gave it everything but could not contain the clinical, relentless driving play of the winners’ pack, led brilliantly by rampaging No.8 Siosiua Moala. He produced one of the great displays by a forward in a premier club final and it was appropriate he put the icing on the victory cake by muscling his way over for the blue and whites’ fifth try on fulltime. HSOB opened the scoring in the sixth minute with an intercept try from 50 metres out to left wing Andrew Tauatevalu. After Waikohu fullback Ethine Reeves missed penalty attempts in the 10th and 17th minutes, HSOB struck again in the 22nd minute when they stole a throw-in 10m from the Waikohu line and prop Russell Burns went over from a forward surge. First five-eighth Cory Reihana converted for a 12-0 lead. Waikohu came back with a penalty to Reeves at the 30-minute mark, and had chances to score further but failed to capitalise, and the half ended 12-3. HSOB went straight on the attack after the break but Waikohu held them out with tenacious defence. Pressure and possession eventually told and in the 55th minute right-winger George Halley was put into space and scored out wide. Leighton, who came on moments before and played his part in the try, slotted the conversion to make it 19-3. Minutes later, after more aggressive and straight running by the HSOB forwards that ended deep in the Waikohu 22, the ball was spun wide and Halley stepped two players to score his second five-pointer. Leighton added a penalty at the 69-minute mark and for the final period it was all HSOB as they threatened the Waikohu line time and again. Waikohu, despite being out of the game, never stopped tackling but could not hold out Moala in the final 30 seconds. Former HSOB coach and now Ngati Porou East Coast co-coach Wayne Ensor was on the sideline. He described it as a dominant performance. “This was the most convincing grand final win you’ll ever see. “They had obviously been well prepared for it and I am very proud of Jamie (Hutana) and Scotty (Leighton). Leighton said the team started well and he felt their experience showed from the beginning. He enjoyed his own contribution and said he was “ready to go again next year”. Hutana was “over the moon”. “There have been a lot of sleepless nights lately for me as a coach, but the boys do the running. To see the hard work pay off like it did today is awesome. Moala was the standout forward but pushed any praise on to his teammates. Waikohu coach Tahi Hiroki congratulated HSOB on their performance. Waikohu skipper Hayden Rutene said it had been an emotional ride towards and into the final. Prop Toru Noanoa was Waikohu’s player of the day for his work rate, with Reeves close behind. Reeves, who played himself to a standstill and made some electric runs, said he felt “a bit down . . . but there’s a good vibe in the team. It’s been a good year and we have made some history”. Halley was named player of the final. 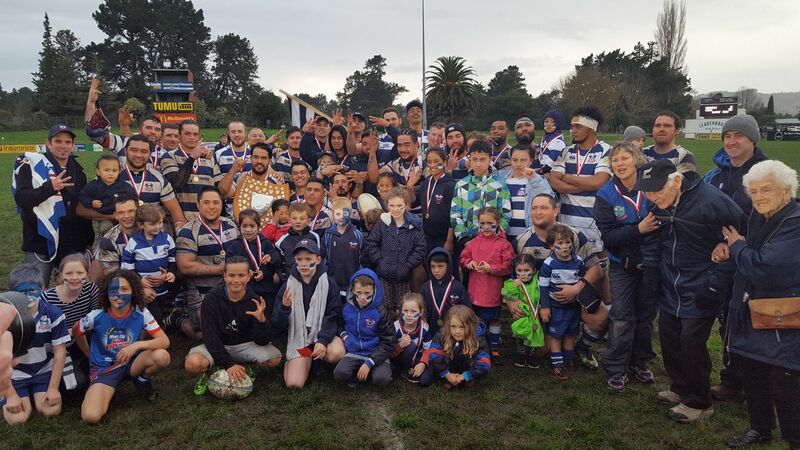 Tapuae are the Poverty Bay Senior 1 champions for 2017. They beat YMP Bumbles 14-11 in the curtain-raiser to the premier final.